Terroir encounters modernity and the result is quiet appealing. While van der Rohe was speaking specifically of architecture, it is by no means a leap of logic to apply his reasoning to any artistic or creative endeavour which seeks to conjure greatness from the ether; rugs and carpets being no exception. 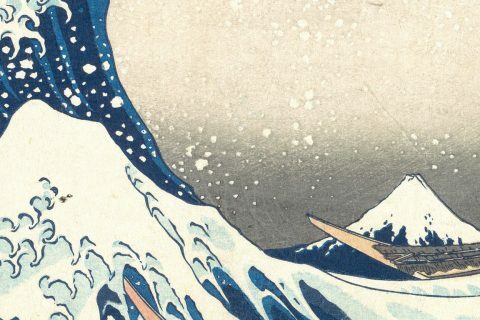 Mimicking – aesthetically – what has been while perhaps well suited for purely commercial endeavours is not seminal, nor does it expand the human experience beyond what is already known in order to create a new genre. Likewise, Le Corbusier may have been speaking about modern architecture, but his sentiment – of an appreciation and knowledge of the origins of today’s forebears – is equally applicable to rugs and carpets. Time and again novelties appear upon the scene; those which uphold the core fundamentals of the time honoured may be so fortunate as to be elevated into this pantheon whereas those less reflective of what should have been learned from history are discarded. This is what winnows grain from chaff, as is said. Style is eternal, enduring, remarkable. It can be held in great reverence whereas what is in fashion, that is, what is fashionable is governed by concerns more ephemeral, more trendy, of those au courant. So while it is possible for any object governed by the whims of taste, specifically herein rug and carpets to be both fashionable and stylish it is only the latter which has the propensity to remain in the hearts and minds of those whom appreciate the form. 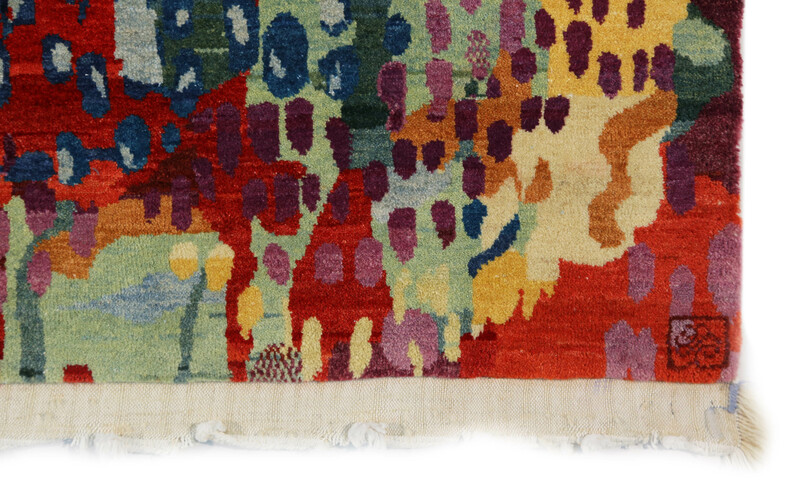 This has been – and perhaps always shall remain – the non-exclusive purview of Persian rugs. Influential owing to age, origins, and a remarkable confluence of trade and exploration carpets described as Persian have long dominated both the aesthetic of handmade rugs and carpets as well the common vernacular of those less erudite to describe any handmade rug or carpet. 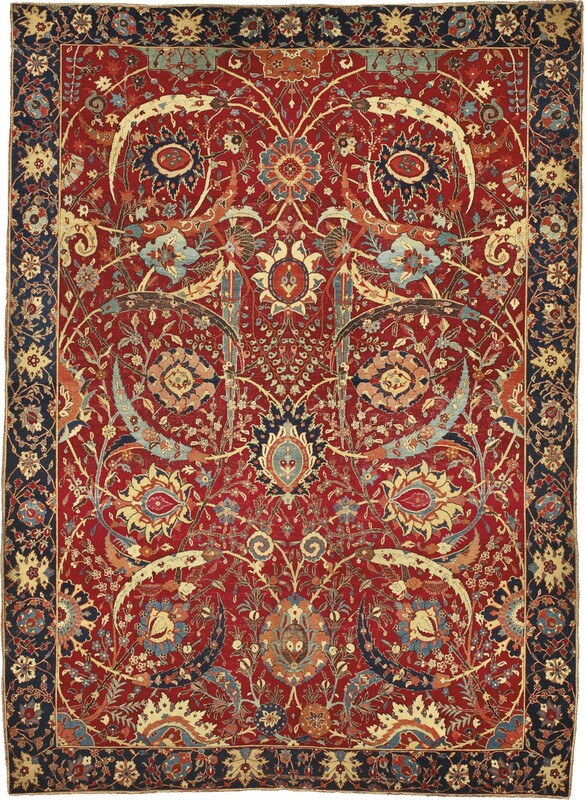 Auctioned by Sotheby’s on 5 June 2013 as part of the ‘Important Carpets from the William A. Clark Collection, Corcoran Gallery of Art’ sale, the Clark Sickle-leaf Carpet far exceeded its estimate of $5,000,000 – $7,000,000 (USD) selling for $33,765,000 (USD) thus becoming the most valuable antique carpet in the world. Dating from the first half of the 17th century and noted as being of the ‘vine scroll and palmette ‘vase’-technique’ the carpet probably originates from Kerman situated in the southeast of what is today modern-day Iran. It is also – for the layman – quintessentially Persian or Oriental in its aesthetic. | Image courtesy of Sotheby’s. ‘Central-Asian would be more appropriate, but Oriental or Persian is a term of convenience that has stuck.’ – Shiv Sikri in conversation with Martha Stewart. Persian and Oriental are two terms whose use in reference to rugs and carpets conjures mental images of familiar designs such as Tabriz, Kashan, Heriz, and Kerman even if the proper names remain unfamiliar or unknown. These designs, just like many others originating in either Iran itself, the geography of the former Persian Empire, and indeed in Central-Asia broadly have also come to be known as so-called Traditional carpets with all three terms used more or less interchangeably, in part due to the region’s former centuries spanning dominance of carpet production and trade. So while there inarguably remain innumerable examples of equally as traditional weaving and design the world over, the aesthetics of Persia have come to monopolize what is known as Traditional, Oriental, or Persian (T.O.P.) design, at least in rugs and carpets from the Western perspective. Concurrent with this convoluted etymology is a conflation of superior quality with Persian rugs and carpets. While it is perhaps understandable that the originator of such a time honoured craft should be held in high regard, it bears repeating that throughout the aforementioned ‘examples of equally as traditional weaving and design the world over’ in addition to those more nouveau there exist a wide range of qualities from poor to exceptional, regardless of country or region of origin. For the purposes of this discussion however, let us assume to only be speaking of the better end of the spectrum. Heretofore the discussion of T.O.P. design has assumed a known and well established visual, illustrated if only in a very cursory manner by the Clark Sickle-leaf carpet shown above. The introductory quotes and exposition serve a singular purpose in this discussion: to act as contrasting juxtaposition to carpets one forgivably might not equate with T.O.P. design. The question must then be asked: What happens when the aesthetics of a Persian – that is Iranian – made carpet move beyond what has been, and embrace what can and may be? Ladies and gentleman, without further ado: Farahan Carpet. ‘Miran’ by Farahan Carpet was inspired by the grouping of ‘beautiful little fish’ in the shallow ocean. | Image courtesy of Farahan Carpet. 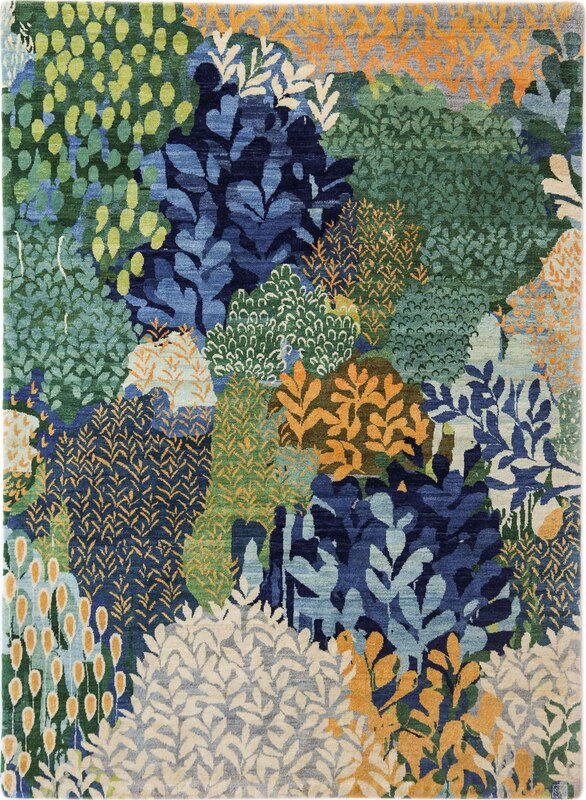 ‘Koohpana’ by Farahan Carpet was inspired by the ‘plants and flowers’ – that is the flora – of the fields surrounding Arak. Iran. | Image courtesy of Farahan Carpet. 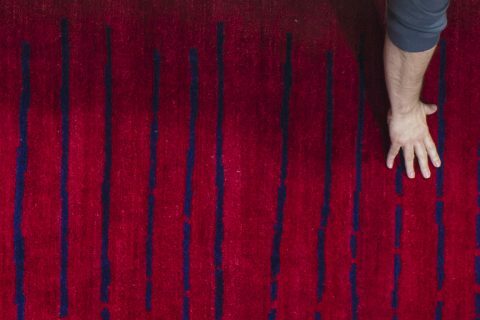 Since 1964 Farahan Carpet has been in the business of producing high-quality rugs and carpets made using the finest Spring shearing of Kurdish wool – important for long staple length – which has been handspun and then dyed using natural dyestuffs. Now directed by the 4th generation of the Farahani family, the carpets utilize materials from the ‘heart of nature’ according to Mostafa Farahani, just like the inspiration for the two designs shown here. This is nothing new. The appeal of authentic T.O.P. carpets has always been in the natural materials, classic handwork ways of making, and inspiration taken from the environment, natural or otherwise. The only differences between these carpets and carpets such as the Clark Sickle-leaf is perspective and interpretation. ‘Living nature plays the lead role in Persian carpet design.’ begins Farahani ‘Every region in Iran looks at nature differently. One particular flower may be designed [interpreted] in many different ways. Stones, sea waves, the galaxy, and other parts of inanimate nature – which are rarely paid attention to – have inspired our designers to create beautiful innovative patterns that mesmerize anyone.’ Farahan Carpet has thus broken the limits of T.O.P. carpets and observes nature with its own unique design eye, while simultaneously remaining true to everything which makes so-called Traditional/Oriental/Persian carpets so esteemed. As the progenitor of all that is modern day Iranian, the techniques of Persian persist and enlighten not only the work of those who still reside in that special place, but indeed the work of those producing outside of Iran. Persian (also called: sennah or asymmetrical) knots are correctly renown for their technical features which provide benefits such as: finer detailing and smoother curvilinear motifs and are widely used throughout carpet making. One could thus argue if a rug or carpet originates in modern day Iran, then the long history of the rug industry both exalting said work and using the techniques thereof, presupposes these works to be T.O.P. as well. Or does it? It may also, to call once again upon Le Corbusier, be modern precisely because of this inherent and dare say unmatched understanding of the history of Persia. Such as it is then, can the work of Farahan Carpet be simultaneously Traditional, Oriental, and Persian? Of course not!? Arguably it is Persian, but to call it Oriental, or even Traditional is a stretch of the imagination to say the least. 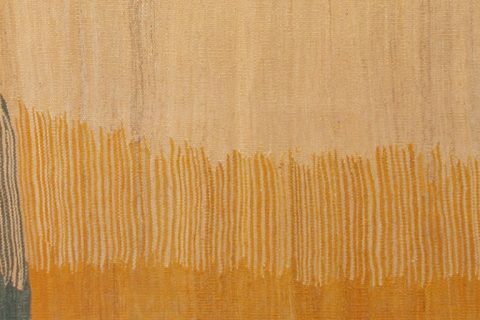 ‘Miran’ by Farahan Carpet is shown here in detail revealing not only the firm’s woven maker’s mark (lower right) but also the raw, as of yet unfinished kilim end of the carpet. | Image courtesy of Farahan Carpet. Therein lies what has baffled me about my thoughts on Farahan Carpet and the aesthetic which is one I unequivocally adore. What does one call this genre of carpet? Unbeknownst until this point has been the fact that the consumer may already know the quality of Farahan’s work as they have been making carpets for various fashionable brands in the occident for years. While I would be remiss to not suggest this interaction has influenced their design direction, it is in the look of these carpets and others of similar in house originating aesthetics that the firm truly finds itself embodying both Le Corbusier and more importantly Saint Laurent. This is something I would hope to not only be fashionable for the consumer of today – because it is – but to also define a style of modern Iranian carpet going forward. Next Post:Crossroads and Avenues | Excelsior! 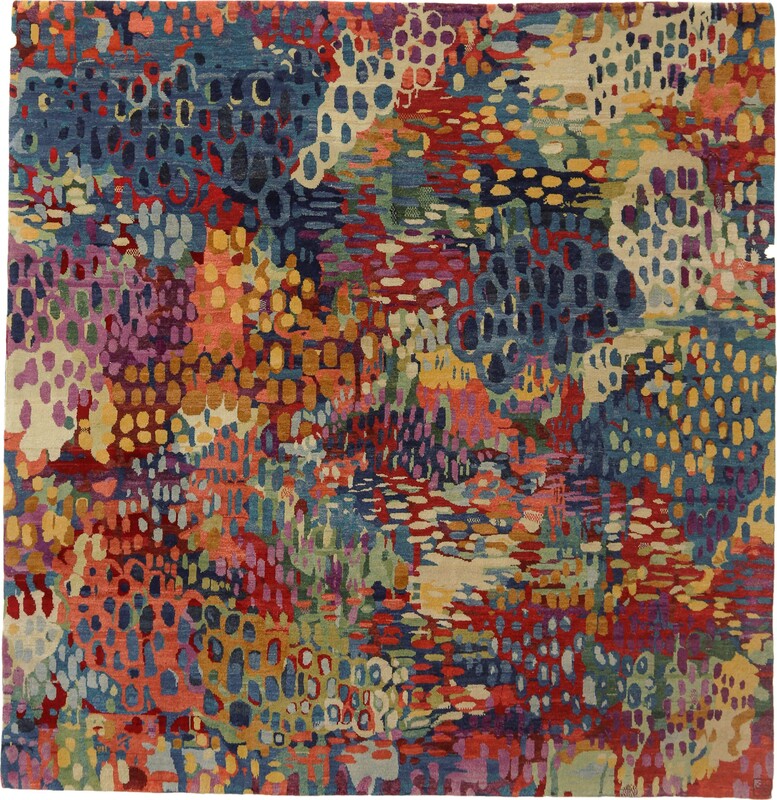 A new collection from UK Heritage Rugs adapts noted artwork into rugs and carpets. The absence of words... The absence of sounds... This is the beauty of silence.